When going through the festival line-up this year, I was overly impressed with the Midnight Madness offerings. Sure, they are usually pretty great – Colin has a great eye for unique genre films, but this year was even more outstanding than usual. I think between myself and Angelina we’ll end up seeing half of them (and only missing out on a couple because of scheduling issues). The one I was most excited for (after The Green Inferno) was Oculus. I asked Angelina if she was interested in attending this film with me. Her very abrupt reply was “Haunted Mirror, are you kidding me?”. She’s not one for horror films to begin with, any anything specifically to do with mirrors is extra-super creepy. I had even heard various rumours and reviews that the film was even more spooky/scary than originally expected. So, perhaps my expectations were too high. In the end, the film was perfectly good, but it just left me a little disappointed. 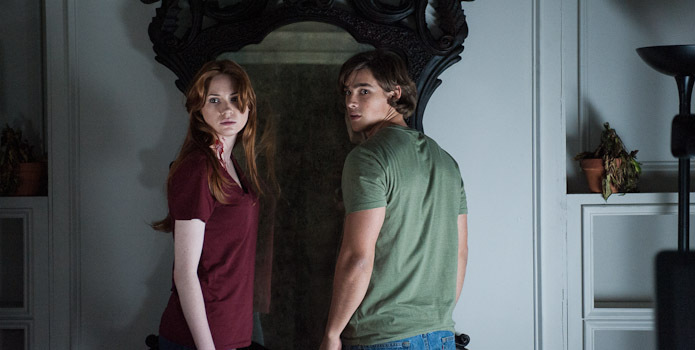 The story centers on Kaylie (Karen Gillan) and her brother Tim (Brenton Thwaites). After being discharged from his 10 plus years in a psychiatric hospital, Tim joins his sister in their quest for answers about the traumatic death of their parents. In a very litteral “haunted by the ghosts of their past” way, Kaylie has set up an elaborate trap for what she believes is an evil spiritual entity that lives inside a centuries-old mirror – whom which she blames for the actions of her father, which ended both of her parents lives. Tim, however, having been treated for so long by pysciatricts and therapists, believes Kaylie’s memories to be faulty, and has a clearer, more logical explanation for the events which traumatized them both. Kaylie refuses to believe this, and as the story progresses Tim’s resolve weakens, as does the audiences, and eventually we are emotionally alongside them as the night unfolds. Part ghostly-home-invasion, part psychological thriller, the movie’s premise and plot are interesting and meaty – but it never really takes off. We relive the past at the same time as the current story plays out, which is an interesting method of storytelling. While this helps us become emotionally connected to these characters, it’s hard to relate since we’re left wondering the whole time if what’s happening is even really happening? Karen Gillan offers a solid performance, and although the subject matter could very easily be translated into a Doctor Who episode – I never got a trace of Amy Pond in her performance (I suppose the American Accent helped). 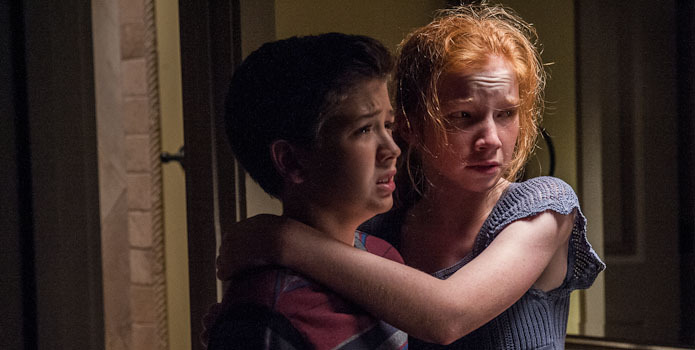 The star of the piece is easily Young Kaylie – Annalise Basso. Katie Sackhoff and Rory Cochrane offer solid performances as the parents, which end up as quite dark and disturbing roles. 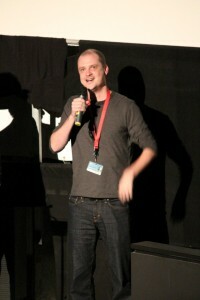 During the Q&A the writer/director Mike Flanagan told us of some of the struggles that he faced bringing his short to the big screen. They considered making the film a found-footage, or even anthology film (reminiscent of V/H/S/2), but in the end chose the format that we’re presented with here. Although not perfect, I would argue that this is the best version this film could be – and appreciate it for that.